Join the Victorian Military with Our Exceptionally British Steampunk Name Generator! Do you miss the days of polite Victorian manners and incredibly tight corsets? Are you ready for a world of daring pulp adventure? Do goggles look ultra-stylish on you? 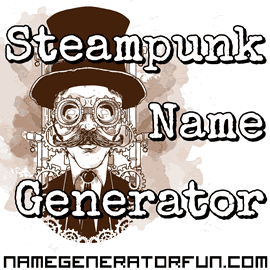 If so, then gaze in wonderment and awe upon the splendour of the steampunk name generator! Buckle yourself into your flying machine, fire up your airship fleet, grab your gasmask, and wind up your watch! The world is your oyster and who knows where you could go! Whether you're looking to write a book or immerse yourself in a world of roleplay, you'll need an old-fashioned name to bring your alternative identity as a steampunk adventurer to life! If you're a fan of Jules Vern or H.G. Wells, or modern authors like James P. Blaylock, K.W. Jeter, Tim Powers, or Cherie Priest, and if you like cogs, corsets, goggles, and dirigibles, along with the occassional bit of time travelling or piracy, this is the generator for you! You can use our generator to create all manner of Victorian sounding male and female names, and you can either choose to make random new characters, or get one that's specifically tailored to your own first and last name. We designed the names to have a military title and a very British, Victorian-sounding quality, with a double-barrelled surname to give your character an aristocratic edge, since in Victorian times, only the wealthy could afford to invent crazy clockwork time machines and sophisticated steam-driven airships! It's an ideal choice if you're looking for a new character for a steampunk-themed tabletop roleplaying game (like Space: 1889, Savage Worlds or Deadlands), a distinctive screen name for social media, or if you just want to inject a little old-school aristocratic style into your day! Either way, we hope you enjoy making some steampunk names, and that you're now inspired to build a whole universe based on clockwork machinery! If you liked this page, you might also like our names for Time Lords, and pirates. Image Credit: Steampunk man adapted from a design by Freepik.